I love scramble recipes. I consider a “scramble,” as any dish that includes scrambled eggs, combined with a meat, starch and vegetable, cooked in a cask iron skillet with very little fat. So, Sunday around lunchtime, I wanted some kielbasa and eggs. 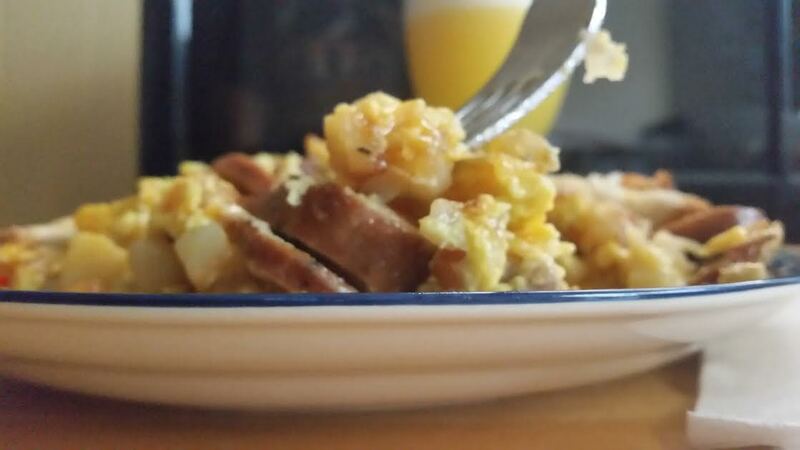 Well, what best way to combine these, as to make a scramble. After searching for some simple recipes, to no avail…I made up my own. Let me know if you try it and what you think. Put a 10″ – 12 ” cast iron skillet on the stove top, medium heat. Allow skillet to warm up, then place kielbasa sausage in pan to allow it to heat up and slightly brown. After about 5 minutes flip. Cook on second side for about 5 minutes. Remove from pan, set on plate, set aside. My favorite cast iron pan is made by Lodge. It is pre-seasoned and ready to use immediately upon purchase. It is heavy duty and can be used on the stove top, oven, grill and Big Green Egg. Click the link below to buy your own. Immediately add vegetable oil to already hot pan. Add enough oil to cover the bottom of the skillet, completely. No more than 1/8″ deep. 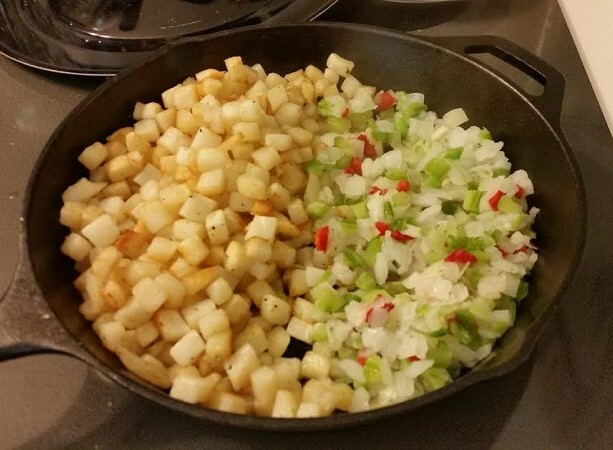 After about 3 minutes, add thawed hash brown potatoes to the pan. Allow to cook for 5-7 minutes, browning the potatoes. Stir frequently, allowing almost all the potatoes to become brown, but not quite hard. Push the potatoes to one side of the skillet. Add the tri-medley vegetables to the pan. Spread the vegetables out on this one side of the pan, to allow them to cook. Cook vegetables for 5 minutes, then gently stir them into the potatoes, thoroughly incorporating. After thoroughly mixing, make a small well in the center of the pan. Add the butter, spreading to coat the well hole. After butter has completely melted, add the beaten eggs. Carefully, mix all ingredients in the pan together. Remove from heat. Add the shredded cheese to the top and slightly incorporate into the mixture. Serves 2-3. Best when served HOT.